We love Walt Disney World, there's no doubt about it. We actually just celebrated our summer vacation there and had a blast. There is also no doubt that Walt Disney World knows how to throw an epic party and their Halloween party is no exception. They've been doing it year after year for quite some time now and this holiday season they have twenty Mickey's Not-So-Scary Halloween Parties on the books. Here are ten photos that just might persuade you to attend this event in Magic Kingdom this year. Happy HalloWishes fireworks light the sky behind Cinderella Castle at precisely 10 p.m. nightly during Mickey's Not-So-Scary Halloween Party. These party fireworks are not to be missed as there is a special 180 degree finale only available for viewing on select hard ticket event nights like Mickey's Not-So-Scary Halloween Party and Mickey's Very Merry Christmas Party. Temperatures may still feel like Summer in Central Florida but you just can't deny that it feels and looks more like Fall once you step foot inside the Magic Kingdom for Mickey's Not-So-Scary Halloween Party. There is no doubt that they sure know how to decorate! In addition to the special fall wreaths, pumpkins and scarecrows draped over every surface of the park, you will also find special Halloween lighting effects once the sun goes down and grim grinning ghosts come out to socialize! It just wouldn't feel like Halloween without some good ole trick-or-treat action. This year Walt Disney World gives guests the chance to fill up their candy sack with top-of-the-line candy at fourteen trick-or-treat locations throughout Tomorrowland, Fantasyland, Liberty Square, Frontierland and Adventureland. You don't even have to worry about bringing a bag to collect candy. All guests are gifted a trick-or-treat bag upon arrival. It's not too often that you can pick up a complementary souvenir from the Walt Disney World Resort but at MNSSHP you can. This year be sure to pick up your complementary "Minnie Mouse Costume Chaos" Limited Edition Sorcerers of the Magic Kingdom Card on Main Street USA near guest relations or at the Liberty Square kiosk adjacent to the Ye Olde Christmas Shoppe. Take note...card distribution ends one hour before park closing. We've all come to know and love the special "Boo to You" Halloween Parade at Mickey's Not-So-Scary Halloween Party but this year guests have been all abuzz about the new Hocus Pocus Villian Spectacular taking place at the castle stage four times nightly. I hope these photos have inspired you to consider attending Mickey's Not-So-Scary Halloween Party at the Magic Kingdom this year. Tickets for this special event start at $74 if you buy your tickets in advance and $79 the day of the event for the month of October. The party runs from 7 p.m. until midnight but your ticket will gain you admission into the Magic Kingdom theme park as early as 4 p.m. For more information visit Disney.com. The photos are amazing. I think this is one of the best times to visit Disney. I'm sure they have a lot ins tore for their guests. I love all of these photos! There's no more magical place to celebrate any of the holidays than Disney. My family has had multiple visits to Disneyland and Disney World but never over a holiday - I've always heard how great Disney does the holidays and have wanted to see one in person. 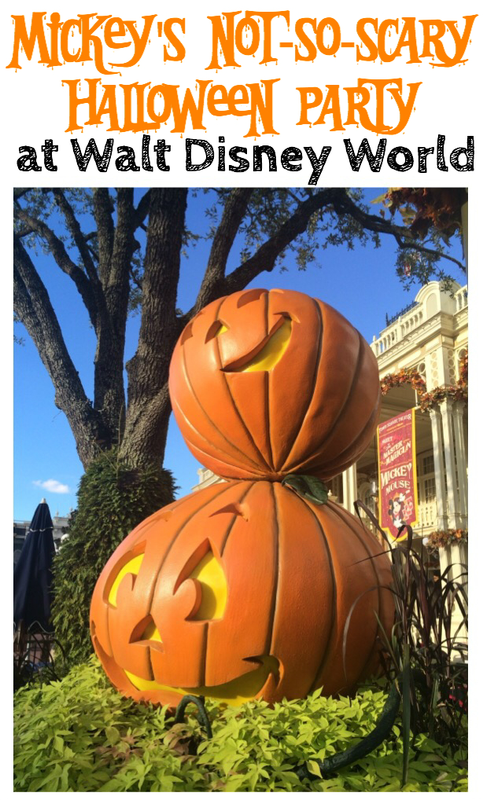 These photos definitely make me want to check out Halloween with Mickey! We happened to be in WDW one year at Halloween. We did some trick or treating there and it was fun. I know my youngest son would love this party! This looks like such a magical event! I wish I loved closer to the park - I'm all the way in NYC! I would love to go, maybe ill go next year.